Two new studies, one conducted in young adults and the other in mice, add to evidence for the broad benefits of a rocking motion during sleep. In fact, the studies in people show that rocking not only leads to better sleep, but it also boosts memory consolidation during sleep. 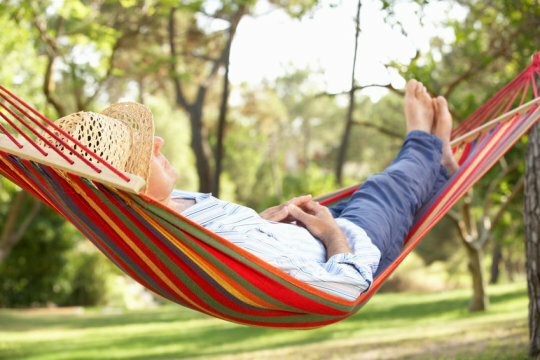 Anyone who has ever put a small child to bed or drifted off in a gently swaying hammock will know that a rocking motion makes getting to sleep seem easier. Now, two new studies reported in Current Biology on January 24, one conducted in young adults and the other in mice, add to evidence for the broad benefits of a rocking motion during sleep. In fact, the studies in people show that rocking not only leads to better sleep, but it also boosts memory consolidation during sleep. "Having a good night's sleep means falling asleep rapidly and then staying asleep during the whole night," says Laurence Bayer of the University of Geneva, Switzerland. "Our volunteers -- even if they were all good sleepers -- fell asleep more rapidly when rocked and had longer periods of deeper sleep associated with fewer arousals during the night. We thus show that rocking is good for sleep." Bayer and their colleagues had earlier shown that continuous rocking during a 45-minute nap helped people to fall asleep faster and sleep more soundly. In the new study, led by Laurence Bayer and Sophie Schwartz, University of Geneva, Switzerland, they wanted to explore the effects of rocking on sleep and its associated brain waves throughout the night. The researchers enlisted 18 healthy young adults to undergo sleep monitoring in the lab. The first night was intended to get them used to sleeping there. They then stayed two more nights -- one sleeping on a gently rocking bed and the other sleeping on an identical bed that wasn't moving. The data showed that participants fell asleep faster while rocking. Once asleep, they also spent more time in non-rapid eye movement sleep, slept more deeply, and woke up less. Next, the researchers wanted to know how that better sleep influenced memory. To assess memory consolidation, participants studied word pairs. The researchers then measured their accuracy in recalling those paired words in an evening session compared to the next morning when they woke up. They found that people did better on the morning test when they were rocked during sleep. Further studies showed that rocking affects brain oscillations during sleep. They saw that the rocking motion caused an entrainment of specific brain oscillations of non-rapid eye movement sleep (slow oscillations and spindles). As a result, the continuous rocking motion helped to synchronize neural activity in the thalamo-cortical networks of the brain, which play an important role in both sleep and memory consolidation. The second study in mice by Konstantinos Kompotis and colleagues is the first to explore whether rocking promotes sleep in other species. And, indeed, it did. The researchers, led by Paul Franken, University of Lausanne, Switzerland, used commercial reciprocating shakers to rock the cages of mice as they slept. While the best rocking frequency for mice was found to be four times faster than in people, the researchers' studies show that rocking reduced the time it took to fall asleep and increased sleep time in mice as it does in humans. However, the mice did not show evidence of sleeping more deeply. Researchers had suspected that the effects of rocking on sleep were tied to rhythmic stimulation of the vestibular system, the sensory system that contributes to the sense of balance and spatial orientation. To explore this notion in the mouse, the researchers studied animals whose vestibular systems were disrupted by non-functioning otolithic organs, found in their ears. Their studies showed that mice lacking working otolithic organs experienced none of the beneficial effects of rocking during sleep. Taken together, the two studies "provide new insights into the neurophysiological mechanisms underlying the effects of rocking stimulation on sleep," Bayer and Perrault write. The findings may be relevant for the development of new approaches for treating patients with insomnia and mood disorders, as well as older people, who frequently suffer from poor sleep and memory impairments. The researchers say it will be essential in future work to explore the precise deeper brain structures involved in the effects of rocking on sleep. "Current tools, such as optogenetics, can help us decipher which structures, or even neuronal populations, receive the stimulus from the otolithic organs and transfer it further to the structures of the sleep circuitry," Franken says. "Mapping the network of communication between the two systems will provide with basic understanding, as well as novel clinical targets to cope with sleep disorders, like insomnia."